They did endure and prevail by being neither Cavalier (“courtly gentlemen”) nor cavalier (“showing lack of proper concern”). This steely, steady, stalwart gang proved they are this season’s best, this season’s champions, under some pretty dire circumstances. With fortitude. With eery focus. Some will poo poo the achievement, offering that the bracket opened up for them. Well, maybe, but they did have to beat the Big Ten champ, the SEC tourney champ and the Big 12 champ that possessed the highest rated D in the land. Some call them lucky, that double dribble no call, yada, yada, yada. I call them ready for the moment, ready to never give in, ready to do what needed to be done to prevail. In each of their last three battles, the Cavaliers were down three in regulation with less than fifteen seconds on the clock. And won. Hunter’s trey after Jerome’s feed. Guy’s triple and threepeat at the charity stripe. Clark’s retrieval and pass to Diakite and his make. One such escape might be luck. Twice? Thrice? I don’t think so. In the title tilt, they blew 10 point leads in both halves. And stayed the course and won. For me, the possession that underscored how savvy this team and their coach are was one when they didn’t even score. My point: After relinquishing the advantage on a Jarrett Culver follow deuce with :35 to play, and a Tech timeout, the Wahoos chose to scurry, not to fool around. They understood that the wise maneuver was not to hold it for a last shot, but attempt to score ASAP. Jerome took it to the hoop as soon as they hurried up court. He missed. 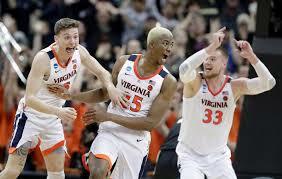 After a couple of Norense Odiase FTs pushing their deficit to 3, UVa proved just as clutch. In eight seconds, they advanced the ball, Jerome found Hunter in the corner, and he was all twine from behind the line. Game tied. Oh yeah, Braxton Key blocked Culver’s shot at the buzzer that would have won it for the Red Raiders in regulation. The Cavaliers went 12/12 at the FT line in overtime. Did I mention Virginia’s defense was downright felonious? UVa. Lucky? I. Don’t. Think. So. The Virginia Cavaliers found redemption the hard way. They earned it. In the off-said words of the only man I call Coach, you get what you deserve. UVA should change their name from the “Hoos” to the “Hou-dini’s after these last 5 games. Remarkably, I somehow enjoyed watching them play in the tourney despite my normal feeling that it is like putting bamboo shoots under the fingernails. Esp’ly the UVA-Purdue game was a true classic. Since the Cards were not involved since the very first game, I tried to watch the refs to see if they are as bad as most people (myself included) generally suggest. Of course there were some controversial calls in a lot of the games. But in every situation, I could at least support the ref’s decision even if I may not have agreed with it. In the Auburn game, there was the double-dribble that I could not have seen or fathomed at normal game speed. This was followed by the 3 point shooting foul in the last second that NEEDED to be called. One of my pet peeves is when refs don’t call things at the end to not decide games–to just let em play. Well, the dude fouled the shooter, no doubt about it, so I was pleased to see that the game was not decided by a non-call. Pitino to UC? What do you think Seedy?